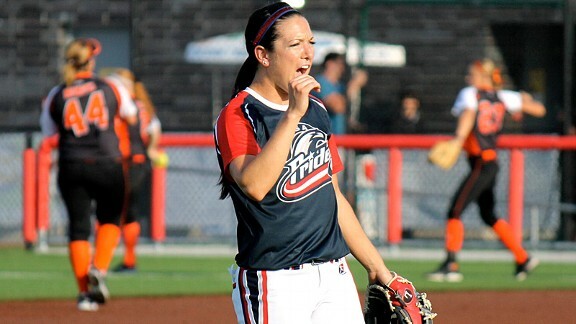 Ashley Charters wears her signature headband during games for the USSSA Pride and sells the company's wares at games, camps and clinics she attends. All that glitters is not gold. In fact, if you prefer, Ashley Charters has purple, pink, silver or red ready to ship. All-American. National champion. World champion. 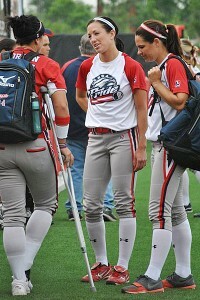 At 26 years old, Charters has accumulated a lot of labels playing softball from her Oregon hometown to the University of Washington to the United States national team and now the USSSA Pride of National Pro Fastpitch. Small business owner, on the other hand, is a label that came her way because it's difficult to do any of those other things if you can't keep your hair out of your face. Like most players in the NPF, Charters has a job outside of summer softball. If pressed into a battle of impressive business cards, few of her peers can trump one that reads chief executive officer. It's a title Charters shares with a partner as the co-CEO of Glitterbandz, a company that designs, manufactures and sells the ubiquitous sparkly headgear that competes with visors and bows on just about every softball field from youth leagues to the professional ranks. It's a title made only slightly less imposing by the knowledge that Charters and her partner are the only employees in the nearly two-year-old venture. Glitterbandz is a small business, with the emphasis on the small, but its existence is a story of admirable entrepreneurial initiative. It's a success story involving one of the world's best softball players that has everything and nothing to do with those skills. Ashley Charters, center, has introduced Glitterbandz to teammates past and present. "I think it's amazing what she's doing with it," teammate Lauren Lappin said. "Obviously, a lot of players have had headband lines and different things they promote, but she has the most active role in that company, more than any other player. She's not even using her name; she's just helping get the company off the ground and doing a great job. And they're selling like crazy. Little girls love them." The other half of the glitter empire is Layne Gorsuch, a graduate of the Art Institute of York-Pennsylvania who met Charters when the latter had earned a starting role for Team USA at the 2010 world championships and was involved in another professional softball venture that was aligned with a company for which Gorsuch worked. The pro team soon folded, leading Charters to the NPF, but the friendship took root, and with it the seed of an idea for turning Gorsuch's headband designs into a business. Within a few months of hatching the idea, they formed an LLC and applied for the necessary licensing in Maryland, where Gorsuch lives with her husband and hand sews the headbands. In January of 2011, they launched their website and started taking orders. Gorsuch is a one-woman assembly line who comes up with the color schemes and patterns and says it sometimes feels as if she barely moves from her sewing machine when orders start piling up. "She deserves most of the credit," Charters said. That sentiment aside, it is a well-struck partnership. Many of the early orders that helped the company find its footing came from teams and organizations in Charters' native Pacific Northwest, including the University of Washington. More than 25 college programs have placed orders, including Florida, LSU, Kentucky, Missouri and Oregon, teams that get their fair share of television exposure and provide plenty of free advertising for a company that otherwise relies on word of mouth and social media. Some athletes lend a name and little else to a product. Charters gave everything but her name in an effort to get a foot in the door of a market otherwise dominated by lululemon and Jennie Finch. "We would not be where we are without her, and I couldn't do it without her." By their own admission, the pair didn't really have a plan, but trial and error served them well. Now in their second year, they've learned from mistakes. They have learned small things that make all the difference, like planning ahead for the dozens of games, camps and clinics in which Charters participates, rather than scrambling at the last minute to make sure she has stock with her. When the business started, Gorsuch spent about 15 hours a week sewing headbands. By June of last year, she quit her job to focus on Glitterbandz and frequently spends 40 hours a week sewing. It is not about to make either partner rich, but it's doing well enough that the co-owners have talked about ways to bring on more hands to increase production -- and the pitfalls therein. "I really like that more personal level, instead of being a corporate level where you don't deal with the people who are running the company -- you have to deal with someone else," Gorsuch said. "Of course, we would always like to make more money, but I would be happy if we could get a little bigger but still be able to manage all of the orders and get that same kind of small business, customer service aspect that we're able to give now." For her part, Charters doesn't act much like an aspiring Gordon Gecko of glitter. A sociology major, she didn't aspire to run her own company. She's all business on the field, a triple-threat hitter who ranked among NPF leaders with a .354 batting average last season and plays second base as well as anyone in the world. You almost don't notice how hard she's working, how hard she had to work to get to where she is, because of the grin, sometimes wide, never wan, she wears. "You can see it on the field all the time, you know how competitive, how determined and what a great athlete she is," Gorsuch said. "But in business, she's a sweetheart. She will do anything for her customers, she will do anything to please them and make sure they're comfortable. I've never seen that real competitiveness [on the business side]; it's more of the really genuine, kindhearted person that she is in normal, everyday life that I think she portrays in the business aspect. "And I think people love her for that." Glitter might seem an unlikely medium to craft an expression of substance, but see past the sparkle, and there is something of substance in what Charters and Gorsuch are trying. A headband is something to keep the hair out of your eyes. It doesn't have to be just that. "After a game when we see girls that have bought one of our headbands and are going through the line for autographs, it's really exciting," Charters said. "Not only are they supporting us, but I have pride that it's our headband, that's our Glitterbandz."